I am planning to report the underlined results in the abstract, and currently looking up literature for explanation to the data. 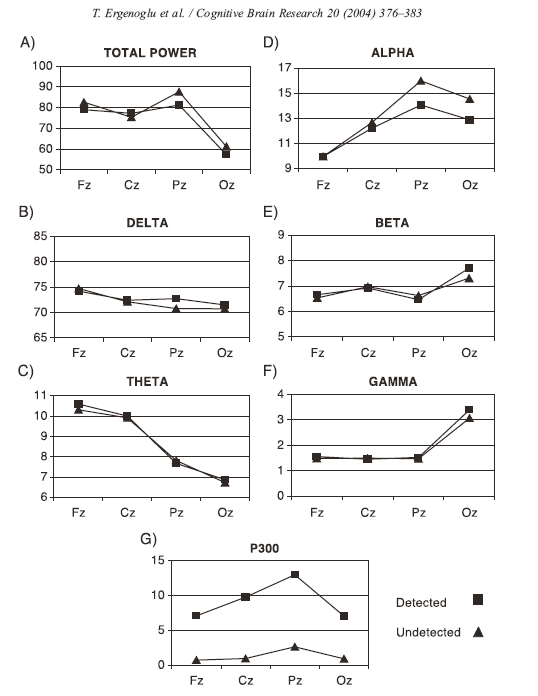 fronto-parietal region had higher prestimulus alpha band power for correct trials. L_PM_BA9 showed less power change in lower band and beta band. Min & Herrmann (2007) tasks required the inhibition of the task-irrelevant feature. Found significantly higher prestimulus total alpha activity (at Pz) in the shape task than the color task. ==> top-down processing prior to stimulation would be reflected in the prestimulus ongoing alpha activity. Min (2008) found significantly higher prestimulus alpha activity ==> constant inter-trial interval condition yielded significantly shorter reaction times than variable interval ==> indicating more efficient preparation for upcoming stimuli during the constant ISI. But, Ergenoglu (2004) and Hanslmayr(2007) found opposite result, higher alpha power in non-perceiver in Pz, Oz. left premotor BA9 and IPL both had higher high-beta band synchronization (0 - 0.2 s) in error trials. possibly the left insula played a role here too. Error trials had more alpha power increase in the fronto-parietal region after the speed change. correct trials had higher low-band (delta&theta) power increase and more beta desychronization in left SMC before and after the GO cue. more alpha band power increase prior to the key onset in error trials. Left IFG gamma band showed interesting pattern, but did not have a very good statistical result. -- I feel the abstract might look a little too busy if I include everything underlined above, what do you think? Min, B.-K. and C. S. Herrmann (2007). "Prestimulus EEG alpha activity reflects prestimulus top-down processing." Neuroscience letters 422(2): 131-135. In order to test the hypothesis that prestimulus alpha activity reflects top-down inhibitory processing, EEG was recorded from 16 subjects performing a color and a shape discrimination task. Both tasks required the inhibition of the task-irrelevant feature. Longer reaction times and P3 latencies showed that the shape task was more difficult than the color task. We suppose that these different task-difficulties are due to a higher salience of the color feature as compared to the shape feature. 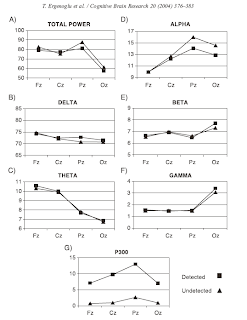 Interestingly, we observed significantly higher prestimulus total alpha activity in the shape task than the color task. We concluded that the inhibition of the more salient color feature in the shape task resulted in enhanced prestimulus alpha activity. Such a relationship between prestimulus alpha and poststimulus performance implies that prestimulus alpha reflects prestimulus top-down processing for preparing subsequent task-performance. Since we observed the [`]task' effect of prestimulus alpha activity also in reaction times and in P3 latencies, prestimulus alpha seems to predict such poststimulus responses. Consequently, prestimulus ongoing alpha activity probably reflects top-down information and modulates subsequent poststimulus responses. Min, B.-K., J. Y. Park, et al. (2008). 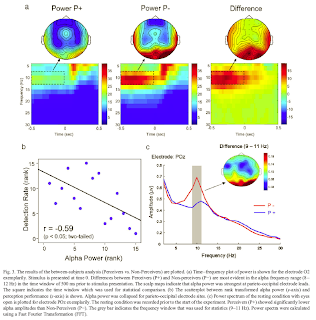 "Prestimulus EEG alpha activity reflects temporal expectancy." Neuroscience letters 438(3): 270-274. Since prestimulus EEG alpha activity has recently been considered to convey prestimulus top-down processing, we investigated whether prestimulus alpha activity reflects temporal expectancy of upcoming stimulation even under the non-classical contingent negative variation (CNV) paradigm. EEG was recorded from 16 subjects performing a color and a shape discrimination task manipulated with constant and variable inter-stimulus interval (ISI) conditions. The power of oscillatory activity was investigated by convolving the EEG signals with Morlet wavelets. The constant ISI condition yielded significantly shorter reaction times than the variable ISI condition, indicating more efficient preparation for upcoming stimuli during the constant ISI. We found significantly higher prestimulus alpha activity in the constant ISI condition than in the variable ISI condition, but no significant CNV even in the constant ISI condition. Such a reflection of temporal expectancy in the prestimulus alpha activity corroborates that the prestimulus top-down mental state for preparing upcoming task-performance is considerably reflected in the prestimulus ongoing alpha activity. Ergenoglu, T., T. Demiralp, et al. (2004). "Alpha rhythm of the EEG modulates visual detection performance in humans." Cognitive Brain Research 20(3): 376-383. The effects of the changes in the frequency spectrum of the electroencephalogram (EEG) on the perception of near-threshold visual stimuli and on the event-related potentials (ERPs) produced by these stimuli were investigated on 12 healthy volunteers. The stimulus intensity, at which each subject could detect 50% of the presented stimuli, was defined as the sensory threshold for that subject. Single ERP trials were separated into two groups: trials with detected and undetected stimuli. The ERPs and the average power spectra of the 1 s prestimulus periods were computed for both conditions. P300 amplitudes of the ERPs, and total power and relative band powers of the delta (0.5-4 Hz), theta (4-7.5 Hz), alpha (7.5-13 Hz), beta (13-30 Hz), and gamma (30-70 Hz) frequency bands of the prestimulus power spectra were measured. Between the two conditions, a specific difference was observed in the relative power of the alpha band, which was significantly lower before detected stimuli (p<0.01) in line with significantly higher amplitudes of the ERPs (p<0.001). These results show that short-lasting changes in brain's excitability state are reflected the relative alpha power of the EEG, which may explain significant variability in perceptual processes and ERP generation especially at boundary conditions such as sensory threshold. Hanslmayr, S., A. Aslan, et al. (2007). "Prestimulus oscillations predict visual perception performance between and within subjects." NeuroImage 37(4): 1465-1473. In the present study, the electrophysiological correlates of perceiving shortly presented visual stimuli are examined. 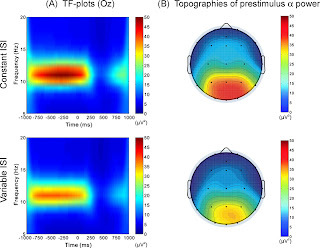 In particular, we investigated the differences in the prestimulus EEG between subjects who were able to discriminate between four shortly presented stimuli (Perceivers) and subjects who were not (Non-Perceivers). Additionally, we investigated the differences between the subjects perceived and unperceived trials. The results show that Perceivers exhibited lower prestimulus alpha power than Non-Perceivers. 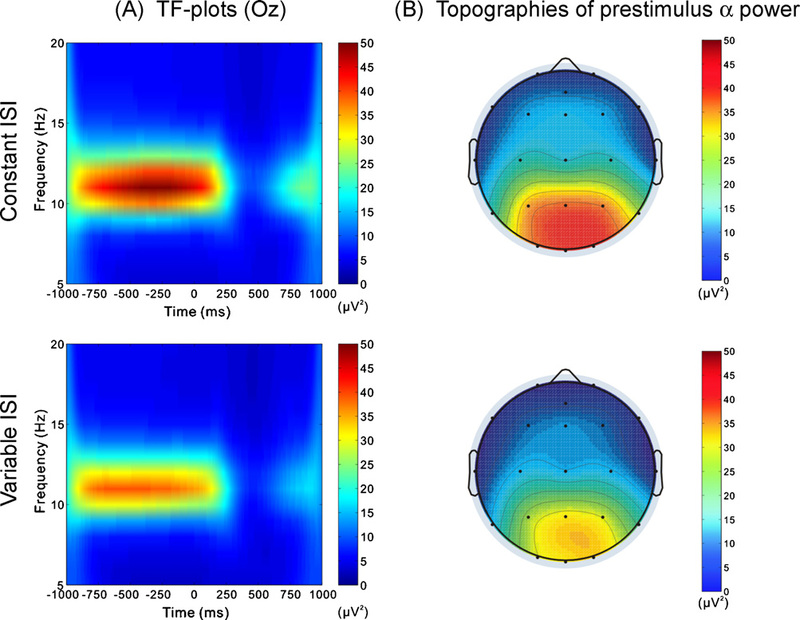 Analysis of the prestimulus EEG between perceived and unperceived trials revealed that the perception of a stimulus is related to low phase coupling in the alpha frequency range (8-12 Hz) and high phase coupling in the beta and gamma frequency range (20-45 Hz). Single trial analyses showed that perception performance can be predicted by phase coupling in the alpha, beta and gamma frequency range. The findings indicate that synchronous oscillations in the alpha frequency band inhibit the perception of shortly presented stimuli whereas synchrony in higher frequency ranges (> 20 Hz) enhances visual perception. We conclude that alpha, beta and gamma oscillations indicate the attentional state of a subject and thus are able to predict perception performance on a single trial basis.